This got to be one of your favourite 'editorials': I think that is a well earnt name, one which your photos truly deserve! The whole outfits just works fabulously together and the dress is just divine! That shade of green looks delightful on you! Favorite vintage films, hmm - certainly Breakfast at Tiffany's, Casablanca, To Catch A Thief, Sabrina, Rear Window. Can't argue with the classics! And my goodness, the leading ladies then were so inspiring. I love your hat it's so romantic!! The wedges are divine and such a bargain...ack ack,envy! I'm not much of an expert of vintage films :/ I love over the top 80's movies though,plus I recently enjoyed watching an old black and white adaptation of Great Expectations. Happy bday! Love your dress! Ooh I love the outfit!!!! :D And wow a Chanel dress! That's awesome! Wow, this is amazing! There's something so Scarlett O'Hara-esque about this outfit. 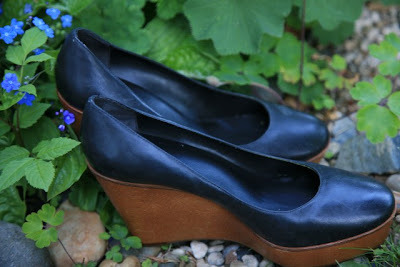 I'm the smae with wedges. thought they were the ugliest things ever. But since they sort of exploded this year and there are some much nicer ones floating around as well I now love them. need the perfect pair so bad! I love the hat with your hair! It's beautiful! One of my favorite old movies is Breakfast at Tiffany's. that has to be the best movie ever! 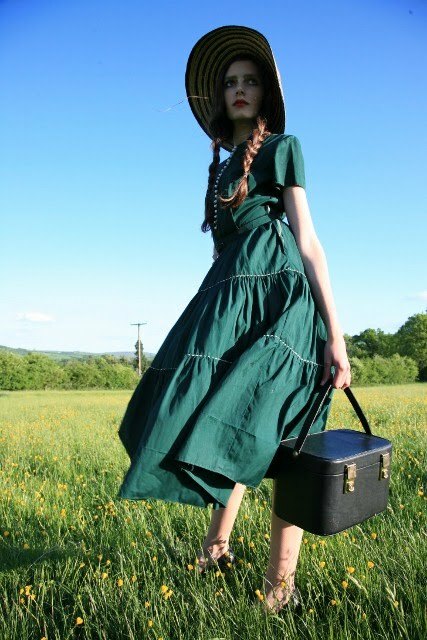 Whaaa, this is totally Anne of Green Gables! (Canadian pride RIGHT there! )Your hair even looks red in some photos, like hers! Looove the shoes and dress, very lucky finds. 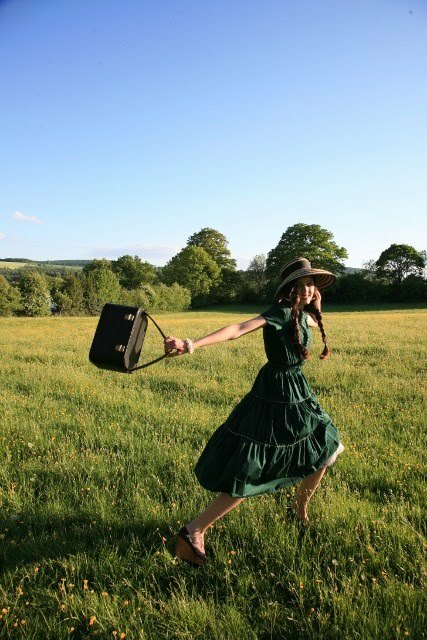 There is a touch of Anne (Green Gables) in there. It's lovely..
happy birthday, Roz. hope this is a wonderful year for you! You look so sweet in these photos. Loving the hat, the dress, the stance. What great fashion sense you have. You're truly a classic stylist. Belated happy birthday, Roz! Gosh, I barely remember being 15, lol. You really have an awareness of what colors flatter you. This green shade is perfect. Fave vintage films? I'll have to give it some thought...So many, but I adore many films from the 60s. And before I forget, happy (if somewhat belated) birthday! You're 15?!?!?! WOW! that makes me slightly depressed inside. YOU WERE 14?!?! Ahhhh hahaha you're so good! And so knowledgable! When I was 14 I was a bumbling idiot! Hahaha. Roman Holiday! Gregory Peck, what a heartthrob. Audrey Hepburn, the most chic woman to have ever lived. 8 1/2 ... Marcelo Mastroianni is beautiful, and Anouk Aimee is so inspirational. Anything with Cary Grant or Ingrid Bergman. Too many favorites to list them all! gorgeous dress, gorgeous hat, gorgeous shoes. I never usually comment, but this outfit is fantastic! I like Funny Face, but love Roman Holiday and the Apartment. These pictures are lovely and the outfit is nearly perfect. I just miss some gloves, well, that's the way I would have styled it and I would probably wear gloves with everything, I love them, the make everything even more glamorous and chic. This 40ies morning sounds exquisite, I'd love to do something like this too. Old films? Don't get me started. I just ordered "High Society". I love everything with Fred Astaire, Gene Kelly and Danny Kaye. I'm also quite fond of "The Glass Slippers" and "Gigi" both with Leslie Caron. I recently bought a book from Clarence Sinclair Bull, he was a photographer for MGM from the twenties to the fifties. It has the most gorgeous pictures of the old Hollywood league. For example a Clark Gable that you hardly recognize because he looks so young and has no mustache. Have a great weekend and thank you for sharing these wonderful pictures. And happy belated birthday. Wow, just wow, you are only just 15! You look far more grown up and gorgeous than I was at 15! You look gorgeous as ever, i love the styling, the dress everything! the first photo is perfect! Congratulations on turning fifteen! I'm glad that you are so passionate about photography, i can see from how you style your self that you have a great eye for detail! Wow, a chanel dress! I'm unbelievably jealous!!! Do you know where this wonderful person bought it, is it vintage? I love Funny Face too! I'm simply crazy about Audrey Hepburn movies, Breakfast at Tiffanys, Charade, How to steal a million...etc! I also love How to marry a millionare and casablanca. I also addicted to musicals like west side story and chicago. I suppose most of my favourite movies are classics, my favourite modern movie would probably be Romeo + Juliet and 500 days of summer (i loved what Zooey Deschanel wore in that movie!). Happy belated birthday! My vintage inspirational films are: All about Eve, The African Queen, Rebel without a casue, East of Eden, Giant...here Elizabeth Taylor is just perfect! I love James Dean!! and holy cow, a chanel dress, your friend must just love you! Happy Birthday!!! I know you're away - felt like posting more shots from Primrose HIll (just posted one this morning) and realised I hadn't seen the last few posts - didn't realise it was your birthday already! Love these shots. Now on to the next ; ) Hope we'll see you guys soon. p.s. Favourite vintage films... so many. My favourite Audrey Hepburn film is one that no one seems to have seen - you'd love it, Roz, it's a story of a married couple (Hepburn and Albert Finney) who keep going on holiday to the same part of France where they met. Different cars, different styles of course, through the sixties. It's called Two for the Road and if you can get hold of it, I'd love to hear your thoughts! And anything with Kate Hepburn & Cary Grant.. Philadelphia Story comes to mind. I agree with Anna, Romeo + Juliet and 500 days of summer, stylistically, are definitely modern classics. Hey, I found you through Jill, Polka Dot! Loved everyone of your photos. Then went through your other outfit posts and adored those too! Adding you to my blog roll now. lovely post!as for the movie, it has to be gone with the wind!cant wait too see the chanel! this looks like a fairy tale to me. i love it. and roman holiday is my favorite movie of all times, it's just perfect. you look stunning. Your birthday sounds like it was a wonderful time! Your so lucky to have a fairy godmother :) Happy 15th darling...and never stop taking pictures! You look so incredible! That dress is amazing and these pictures are beautiful. Happy belated birthday! Such a beautiful post and location! Beautiful photos, Roz, as usual....I really enjoy your honest and unique perspective in fashion. Your photos and styling are so genuine and, for lack of a better word, "real" to your personality! It is very refreshing. And as for one of my favorite classic films...Charade with Carry Grant and Audrey Hepburn. It is fantastic! Sweet, quirky, mod, and of course, gorgeous. Hope you get a chance to enjoy it as much as I do. The first picture is absolutely amazing! I love your vintage look, and your photos are gorgeous! 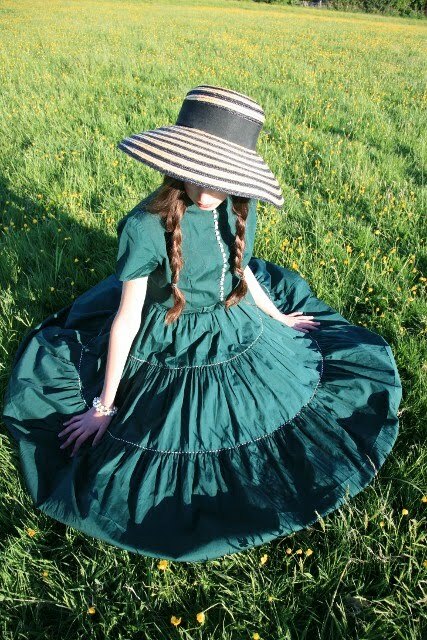 I love the dress and the hat is amazing! I actually held my breath when I looked at these photos. im definitely following your blog!! !